And with all the attention and unwavering devotion he receives, as his stardom and fame grows, it all begins to go to Bacon's head. Bacon doesn't care about the feelings of the other breakfast meats. He doesn't care that his old friends miss him, in fact he pretends that he doesn't even know some of his friends - cause who needs friends when you have fans? Bacon starts driving fancy cars, wearing fancy hats and grows a fancy moustache - 'everyone loves a fancy moustache' - but through it all, Bacon has forgotten one very important thing. He has forgotten why he is so popular. Yes, it's because he smells so good, but it's because he TASTES so good too! Things do not end so well for Bacon, and we learn that there is a price to pay for being loved by everyone. 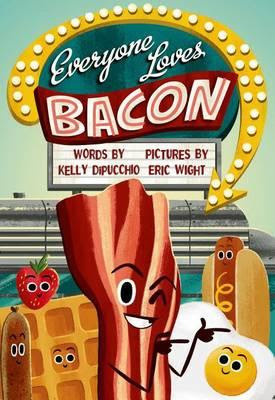 There are so many great moments through the illustrations of this book, as Eric Wight cleverly crafts our favourite breakfast foods into fantastically expressive characters, using diner props to show Bacon's exciting journey to fame. With simple fun language, a few punny puns and a great dollop of quirk, this book will have everyone in giggles and most likely leave you with cravings for a big scrummy cafe breakfast.